A gentle, unassuming man, Willard’s happiest in his frame shop near Galax, Virginia, the home to much of the Blue Ridge Mountain’s best Appalachian folk music. He’s been playing music in the area for years, ever since moving to Galax in 1962 from Kentucky. He grew up there in coal mining country, not far from where Loretta Lynn was born, but really came into the music in Galax. “When I came to Galax, I couldn’t believe it,” Willard says, “every family had a musician of some sort. Music was in the air around here. It was mostly old-time and bluegrass, mostly traditional music but others too.” Forming up with a number of different local bands, Willard began writing songs and sharing them with friends and tourists coming through the area, later touring nationally in a band, Skeeter & The Skidmarks, with his son-in-law Scott Freeman. He still plays regularly in the region, twice a week in the summer months at the Blue Ridge Music Center, a famous stop on the Crooked Road tour. As a songwriter and as a visual artist, Willard is known for his evocative depictions of Appalachian culture, the old “mountain spirit.” You can hear this on the album with the song “Sweet Virginia Beauty,” written originally about a regional apple variety but shaped to be a love song, or with “The Workin’” which portrays Willard’s memories of growing up deep in the Cumberland Gap region of Kentucky’s Appalachian mountains. One favored song recalls the traditional gathering of “salat” by women in Kentucky (a kind of wild greens). “We’d help each other in the fields in the summer back when I was a boy,” Willard remembers. “People lived off the land and there was a lot of hard work to do.” Willard’s got a wry sense of irony and humor as well, as you can hear in his song “Robin D,” which tells the story of how a man’s love for his boat sundered his marriage, or the song “Ern & Zorry’s Sneakin’ Bitin’ Dog,” which has become a favorite of his granddaughter Dori Freeman’s sets. Just as Willard’s famous pencil art references the region’s musicians, so do his songs, as in “My Henderson Guitar,” a loving ode to the work of famed local luthier Wayne Henderson. Home and family loom large in this music, as they do among the people who live in this storied region. For Willard, it’s been a blessing to see the career of his granddaugher Dori Freeman blossom. “First time I heard sing,” he says, “she was about 16 or so I guess. I was just blown away by her voice. She just had an incredible voice.” For Dori, it’s hard to imagine her life without music. “Music has always been the most important part of my family,” she says. 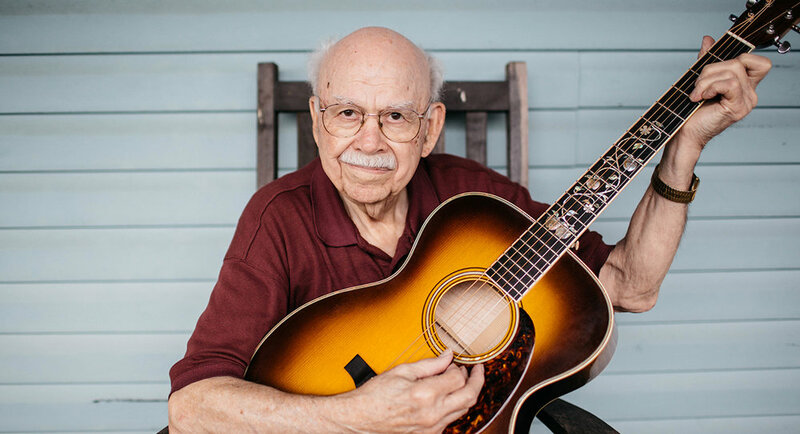 “It’s a big part of why I have such a good relationship with my parents and my grandpa.” You can hear the old-time mountain music, made among the closest family members, in Willard Gayheart’s new album, and if 87 years was a long time to wait for his first solo record, at least he’s been busy building up to it.